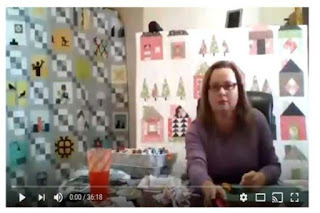 So, crazy me did a Facebook Live video this morning with quilting tips: my favorite methods to make half-square triangles, my current favorite Quilt Book, tips on fabric and project storage, etc. Phew! Sort of nerve-wracking but had to be done because I will go live again next week on someone else's site. I uploaded the video to YouTube. The camera and sound quality will improve on the next one - newbies have technical problems regardless of how much they research. One more learning item about to be checked off my list. My quilting activities lately are restricted to pattern writing. Lots of patterns for clients so I have been making test blocks as opposed to whole quilts. Next week I will embark on a major sewing marathon to make about 6 quilts before April 1st. I think I should place an ad in the local newspaper looking for sewing elves! 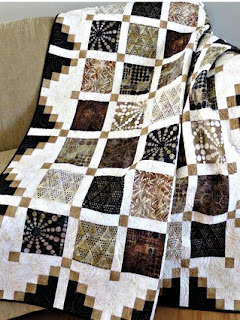 This gorgeous quilt pattern is called Simply Cool Quilt Pattern. A perfect name. I think it is ideal for showcasing favorite fabrics. I love the border - isn't it cool? You can download it if you want to start on it right away. It would also look great in a scrappy version. By the way, this is post number 700! Yeah!